Hull is the worst place to live in the UK and Surrey's Epsom and Ewell the best, according to a television show. Channel 4's The Best and Worst Places to Live in the UK based its rankings on statistics for crime, education, employment, environment and lifestyle. Armed with statistics from all 434 UK local authorities, researchers said Hull saw around 69 crimes a day. Epsom and Ewell was singled out for high education standards, large open spaces and very low crime rate. Nottingham, where the Queen's Medical Centre deals with more gunshot wounds than any other UK city, was ranked as the second worst place to live in the programme presented by property experts Kirstie Allsopp and Phil Spencer. The Midlands city was also found to have the highest number of burglaries in the UK. On the other end of the scale, the City of Westminster in London was deemed the second best. Open spaces such as St James's Park and Regent's Park, as well as the West End's theatre land played in its favour. The borough also scored points for being "filled to the brim with fabulous bars and restaurants". Meanwhile, several factors contributed to give Hull the unattractive tag. In terms of education, the city ranked worst with 35.1% of its 16-year-olds gaining five or more A* - C grades at GCSE. Hull, which has 101 chip shops, was also deemed the fattest town in the UK. The MP for Hull East and deputy prime minister, John Prescott, defended the town in light of the programme's findings. 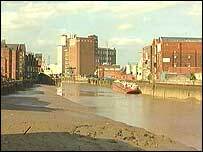 "It is arrogance beyond belief to proclaim Hull the worst place to live. "I challenge them to come to Hull and I will personally show Phil and Kirsty that it's a great northern city and a great place to live and work," he said. In contrast, Harrogate in Yorkshire was rated the third best place to live in the UK. Researchers found it had above average sunshine hours of 1680.3 per year and less-than-average rainfall. It also made the top 2% in the UK for education with 73% of students getting five or more A* to C grades at GCSE. The town also scored points for having more mineral springs than anywhere else in the world, Channel 4 said. Strabane, in the north west of Northern Ireland, was named as the third worst place to live in the UK. This was partly because the percentage of economically active people was 68.2%, compared to the UK average of 74.1%, and the number job seekers' allowance claimants was more than double the UK average.